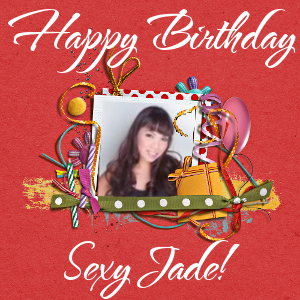 Just About Anything: Happy Birthday Jade! Another blogger is turning a year old today. This person is special because she one of my marces. She is none other than our beautiful marce Jade and she is known in the blogging world as Momma Wannabe. But she is more than just a wannabe mom. She is also a Diva Fabulosa and proudly a Filipina Blogger. For your birthday, I wish you good health, happiness, peace within yourself and within your family, and of course, a bouncing little one that will finally complete your family. And here's some much needed baby dust because I know you want a child more than anything else in the world. I pray that the embryo transfer will go just fine and that your dreams of conceiving will finally become a reality. I have included you in our prayers to the Holy Infant Jesus, praying that He will grant you the little one that you have longed for so long. I do believe in the power of prayer. I also know that you are trying to conceive so let me share this beautiful prayer with you. I hope that you will take the time to print and recite this one during your moments with our God. for my being able to see and to hear this morning. thought that was not pleasing to you. I ask now for Your forgiveness. Safe driving for teensPlease keep me safe from all danger and harm. Clear by designto clear my mind so that I can hear from You. Control Let me not whine and whimper over things I have no control over. that God changes people and God changes things. that they are out of debt and all their needs are met. circumstance, or situation greater than God. be blessed with being fruitful and is healed from unseen harm or danger. I pray that every woman gets the little baby that her heart desires. Just keep your head up and your faith strong Marce Jade. I know that you will be a MOTHER soon! And may this day be the best and happiest birthday yet! God's blessings be with you always! Marce this is truly one of the happiest birthday I have had. Firstly because my husband is home to celebrate it with me and my brother is here as well. Secondly because I have you guys in my life too! Thanks for this wonderful greeting and gifts.